Thank you for choosing Thorek Memorial Hospital for your healthcare needs. We understand that a visit to a hospital or outpatient care center can be overwhelming. At Thorek, we strive to make the patient and visitor experience as stress-free and comfortable as possible. Our team is always available to answer questions and help you gather the information you need regarding your health and our services. If you don't find the answer you're looking for on our website, please call our main hospital line at 773-525-6780. We'll be sure to direct you to the right personnel for prompt assistance. 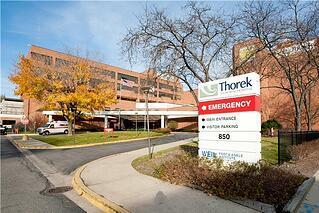 At Thorek, we aim to provide outstanding patient care every step of the way. This Patient Information page will guide you to information regarding accepted insurance, patient financial assistance, hospital amenities and much more. If you don't find the answer you're looking for on our website or need additional information, please call our main hospital telephone number at 773-525-6780. We encourage loved ones to visit and participate in decisions, treatment and daily care plans as determined by the patient. This Visitor Information page will provide information about visiting hours, parking, hispital amentieis and much more. If you don't find the answer you're look for on our website or have questions about an upcoming visit, please call our main hospital telephone number at 773-525-6780.